When he got off the track after college, Justin discovered the bodybuilding lifestyle. Now he's on a path to a pro card and a future in fitness. Justin Peel used his track and MMA experience to keep fit through adolescence and college, but now that he is out, bodybuilding is his obsession. His workouts are fast-paced, because this former hardgainer likes to hit it hard and get back to life. We spotted Justin on We 'Mirin, but you can find him on our broadening social network. 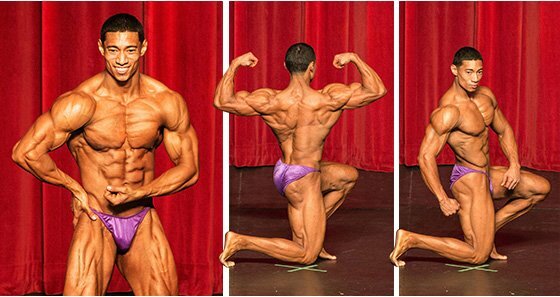 Check out this aspiring IFBB pro if you want to see one of the ascendant bodies in the sport. In the meantime, join us in congratulating him as February's BodySpace Member of the Month! What led you to the decision to embrace the bodybuilding lifestyle? After I graduated and my track career came to an end, I pretty much stopped everything related to fitness. I knew I wanted to be done with running and I wanted to pursue bodybuilding, but I went about it the wrong way. I lifted sparingly. When I did go, it was more of a pseudo-powerlifting/bodybuilding routine. Once I managed to get up to a soft 185 pounds from a shredded 155 pounds, I decided I needed to cut down and start over. What kind of changes have you made since then? In the never-ending attempt to gain size, I go through cycles of dirty bulking, clean bulking, and short cutting periods just to make sure the number on the scale mostly reflects good weight. What is the biggest difference between track and bodybuilding workouts? Track workouts are basically geared toward explosiveness and power. The bar needs to move fast, but the weight needs to be there as well. The core lifts were Olympic movements like power cleans, snatches, and clean-to-jerk or split jerk. One of those was always first on the list. From there it would be a basic compound movement like squats or bench press, low reps like 3-5, pyramiding up in weight. There would often be chains or bands involved, and there were a lot of dynamic movements like box jumps and medicine-ball throws. I miss that type of training, because it was fun and fast-paced. With bodybuilding, the goal is hypertrophy, trying to get the fascia to stretch a bit, and properly stimulating the muscle tissue. I'm not nearly as fast or athletic now! How have martial arts assisted your bodybuilding goals? It gave me an advantage of developing some muscle at a young age. I nailed the fundamentals of flexibility, power, speed, balance, and a whole host of other things early on. Most workouts were bodyweight when I was much younger, beginning at age 5. Later, I used kettlebells in some classes. The actual weights didn't come until much later when I was a teenager, but that was mainly for muscular endurance and cardio. I apply much of the discipline that I've attained through the years to everything I do, especially bodybuilding. 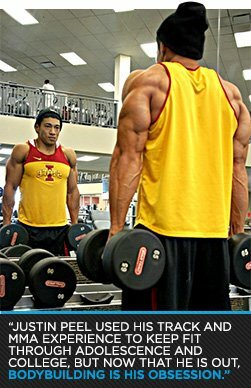 I initially created a profile on BodySpace so I could comment on the forums. I never became a regular commenter, but I still frequent the forums almost daily to keep up with what's happening with the pros. What would it mean to you to win your IFBB pro card? Winning an IFBB pro card was not my original goal, but following the sport more and more seemed to make it evident that winning a pro card would make it easier to achieve other items on my bucket list. Obviously becoming an IFBB pro is the ultimate culmination for bodybuilding amateurs of today, but I don't think that necessarily needs to happen for me or anyone else to feel that our dedication has been affirmed. You can still be the best version of you through commitment and devotion. Some people need that external confirmation and only do it for the attention of others, but if you are motivated to do things for yourself then getting a pro card will never be the root of your motivation. BodySpace helps the most with motivation. To see the changes that people who are not pros have made and the accomplishments they've achieved is the best motivation I can have. The amazing transformations and the show condition some achieve are awesome. They help me to know I can do the same. Male bodybuilders sometimes take heat for being vain or meatheads. Do you have to battle any negativity? Aside from your uneducated keyboard heroes, I have not personally been affected by any negativity in person. In the gym I'm typically covered up and quiet. I don't wear cutoffs unless taking photos and I'm not a loud lifter. Outside of the gym I'm sometimes associated with bodybuilding because of how my clothes fit, but it's mostly by the people at work and my friends. What is your favorite muscle group to train, and can you give us a sample workout? Unlike most people, I enjoy leg day the most. I think it is the most challenging and painful body part to train, so I welcome that day. My routine typically changes every 6-8 weeks, but I've listed a workout I believe gives me some good gains. How do you stay motivated for the long term? By understanding that gains do not come easy, especially for ectomorphs and hardgainers. I know where my end goal is for my physique and I set smart goals to reach it. It's much easier to stay motivated when you chop your final goal up into smaller, more achievable targets. I was guilty of overtraining when I started bodybuilding. I thought more was better and I wasn't consuming nearly enough calories or getting sufficient rest to recover. There has to be a combination and balance between all of those factors as well as education. Study your craft and learn about the body and how everything affects it, because in the end bodybuilding and competing are a science. There is also the trial-and-error part that everyone will have to go through, for the reason that there are generic philosophies on how to cut or gain, but ultimately you need to find out what your body responds too. You won't find me with an iPod or mp3 player at the gym. House music is fine. I kind of space out when I train and I don't listen to any music. You have some serious muscle. Any tips for building that much mass? For all my hardgainers out there: Set short, realistic goals. If you can manage to add 10 quality pounds per year, you're doing it right. It may seem like a long road, but you can make it. When I graduated high school I was all of about 135 pounds, fully dressed with lead in my pockets. I did it; you can too. It's an excellent forum to network with others who have common interests and goals. There are people out there you can learn from and who will help you build a support system to help you stay on track. The average person classifies the dedicated as "obsessed," so BodySpace is kind of a refuge—a place filled with others who understand. Bodybuilders have school, day-jobs and families, and still dedicate hours in the gym each week. How do you strike a balance? I tell people all the time that I love to work out, but I hate spending my day in the gym. I usually work out alone and rip through my workouts in 45 minutes to an hour, warm-up included—except for leg day. I lift with BodySpace member lawrence_ballenger from time to time, and he hates it because I cut his rest time in half! 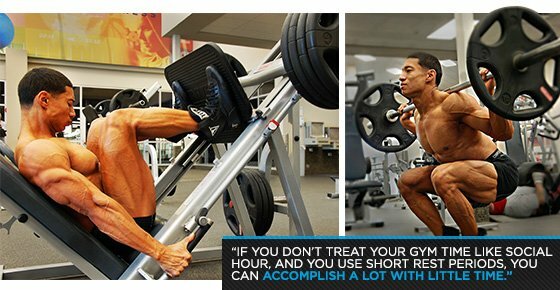 If you don't treat your gym time like social hour, and you use short rest periods, you can accomplish a lot with little time. I also take a de-load week every 6-8 weeks to let my body recover. and that helps with fatigue. If my body is feeling tired and broken, I'll listen to my body and skip a day. Is there anything you would change about BodySpace? I really like the latest setup and the fact that there is the Fit Status portion now. I wouldn't mind if it could somehow be linked to Instagram or Twitter, just because I'm not one for sharing my bodybuilding-themed photos on Facebook. That's what I have BodySpace for!